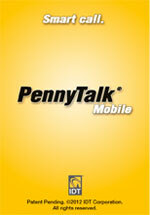 Enjoy big savings, exceptional call quality and easy dialing from your iPhone with the free PennyTalk Mobile app. There are no connection fees and no access or PIN numbers to dial. 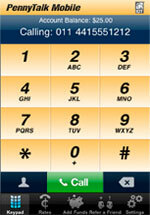 Plus, now you can control how your calls are made -- use your minutes, your mobile data plan or Wi-Fi. 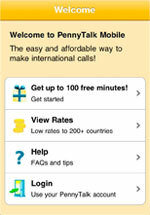 View our low international calling rates from within the PennyTalk Mobile iPhone app or click here. When your account balance runs low, you can quickly add funds by dialing 233 (ADD) from within the app. 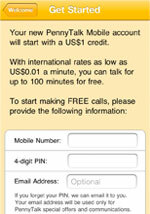 Or, set up Auto-Recharge in the online Account Centre at pennytalk.ca or pennytalkmobile.com to ensure you never run low on funds.